German voters have given an epic thumbs down to their leaders in an upsetting election for Germany’s ruling parties. Chancellor Angela Merkel, “Mutti” (mother) as she has come to be known, has welcomed over 1 million Syrian migrants into Germany on her own authority (which she seems to have overstepped) and claims Germany can easily absorb them. The spike in violent and gruesome murder-rapes, some in broad daylight, increased crime, and vandalism of churches in Germany among many other complaints has left average people concerned for their safety; and not at all certain their leaders are looking out for it. German leaders seem more eager to defend political correctness than to defend women’s rights or religious freedom. Click here for full election Results. Germans are also concerned about the effect this influx of recent migrants from the Middle East will have on political Islam, that is, the effort to establish Islamic law and promote the Islamic agenda in Germany. Islamic courts, operating under Sharia law, have appeared in several western European countries. Moderate Muslims, too, are concerned for their own safety and are also eager to curtail the spread of this violent, fundamentalist interpretation of Islam. Immigration is not the only issue: Germans are concerned about the stagnant economy, the effect of the Euro on Germany’s financial future, and the impact of the European Union (EU), which Germany leads. On all of these matters many German voters gave a great vote of “no confidence” in the country’s two main parties. Germany’s lower house of parliament, the Bundestag, is chosen by proportional representation. Voters choose among political parties who receive a number of seats according to their total percentage of the vote. Germany is a multi-party democracy in which there have regularly been four or five political parties in parliament. The Chancellor, the executive who leads the cabinet, is chosen by a majority of the Bundestag and must maintain the support of that majority to remain in office, otherwise the Chancellor could be replaced or early elections held. In a mutli-party democracy, it is often necessary to join several political parties together into a coalition government in order to achieve the necessary majority to elect an executive. Germany is led by one of two main parties, the CDU and the SPD. Both parties have been governing together for eight of the last twelve years. While these parties might appear to have fared well in the election, this is deceiving. Better results were to be expected if their government had been popular. The CDU or Christian Democrats, are a centre-right party (in partnership with the Christian Union of Bavaria – a regional party). 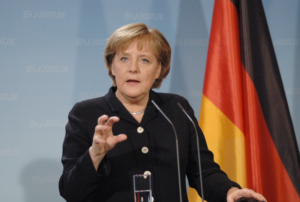 Angela Merkel is the current leader of the CDU and she and her party have led the government since her upset defeat of SPD Chancellor Gerhard Schroeder in 2005. 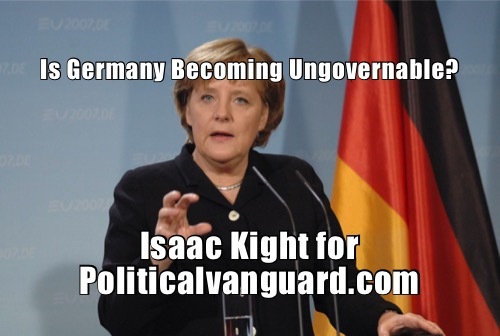 In American terms he CDU might be defined as socially conservative and economically left. The CDU has championed the “corporatist” philosophy of German economics since the post Second World War era when the party was founded by Konrad Adenauer. The SPD, or Social Democrats, a left-wing socialist party, have roots that go back to the failed Weimar Republic when Kurt Schumaker fought along with other German leaders to prevent Adolf Hitler and the Nazis from coming to power. This party is dedicated to “democratic socialism:” big unions, welfare benefits, and a plethora government financed programmes. These two parties have been governing together in a “unity” coalition since 2005; excepting the period from 2009-2013. Voters have repudiated both of these larger parties by choosing smaller parties in this election. Perhaps the greatest thorn in the side of Angela Merkel as she seeks to form a coalition and serve out her fourth term in office, is that she has few coalition partners. The CDU earned 34.7% of the vote in this election down from 41.5% four years ago. The SPD earned a dismal 21.6% down from 25.7% four years ago. In 2013 the two parties together earned 67.2% of the vote (just over 2/3rds) but fell in this election to 56%, a double-digit decline. One party in particular has risen in popularity to the angst of German mainstream leaders: the Alternative for Deutschland (AfD). AfD is opposed to absorbing the growing number of migrants fleeing to Germany. This party agrees with the sentiments of Donald Trump’s recent speech to the UN General Assembly that refugees should be cared for as close to their home country as possible and should be able to return home when the conflict has come to an end. AfD opposes political Islam and has earned the support of some moderate Muslims in the process. In an especially vexing area of concern for Germany’s mainstream leaders, AfD supports major reforms to the EU including an easy Brexit for the United Kingdom. Alternative for Deutschland earned 12.6% coming in third among German parties. AfD has never earned seats in the Bundestag before but will hold 94 seats out of 709 total. Naturally, the political elites and leftwing press are eager to brand AfD as racist, anti-Semitic, and equated to the Nazis. The Green Party is calling for many extreme anti-Global Warming measures such as were put forth in the Paris Climate Accord. They will demand the closure of some 20 coal power plants in Germany, among other environmentalist measures. The FDP, the other likely coalition party, is staunchly opposed to these measures and will be very reluctant to sit in a governing coalition with the Greens. It may very well be that Germany will have to hold a new election in an effort to create a workable parliament that can form a majority coalition. If a new election were to be held it is unlikely to strengthen the larger parties by much. In fact, it may well backfire with AfD and other smaller parties gaining still larger percentages of the vote. 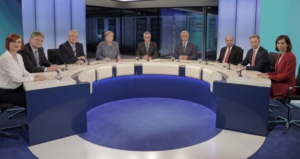 On election night it is traditional for the leaders of the German parties to gather for a televised discussion called the Elephantine Roundtable; so called for having all of the political heavy weights in one place. On this election night, the elephant in that room is the general lack of confidence in the current leadership. Perhaps “Mutti” Merkel should consider bowing out gracefully from her political career and allowing another leader to take the helm at the CDU. A snap leadership contest would bring forth a new direction for the CDU and could lead them into a second round of elections with a fresh start. At the roundtable on election night, Mrs Merkel, stating the obvious, commented that the CDU needs to win back voters who went over to AfD. 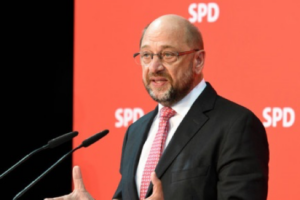 The Christian Democrats cannot achieve this end in a coalition with the Social Democrats or the Greens and not so long as they are led by Angela Merkel. One of these will have to go. Very helpful article. Clarifies so much for me that I would never have time to research. Definitely a piece to share with others!